Andrew Feldman, M.D., from the Hematopathology/Laboratory Medicine and Pathology at Mayo Clinic, is figuring out the best questions to “ask” T-cell lymphoma cells — to hone in on their weaknesses. This work already has produced important answers that may eventually change treatment for some patients with this rare and lethal cancer. About 6,000 Americans are diagnosed annually, and two out of three patients die within five years. Dr. Feldman and his colleagues believed that the tumors themselves could answer questions so treatment could be tailored to individual patients and be more effective. About five years ago, Dr. Feldman began noticing the same genetic abnormality cropping up in the T-cell lymphoma tissues he was analyzing. The abnormality — a cutting and pasting together of genetic material known as a chromosomal translocation — had all the makings of a good biomarker for the disease. As Dr. Feldman tried to figure out what specific gene or genes were being rearranged, he hit technological roadblocks. That’s when he enlisted the help of the Biomarker Discovery Program to apply “mate pair” sequencing to the problem. Mate pair sequencing is a powerful next generation sequencing technology that is extremely efficient at identifying chromosomal translocations in DNA. “We accomplished in two weeks what I had been struggling with for two years,” says Dr. Feldman. One biomarker identified a group of patients with excellent overall survival. Some patients lived for decades even when they had been treated with less intensive regimens. “This suggests the risks associated with aggressive therapy might not be warranted in these patients,” says Dr. Feldman. The second biomarker identified a small group of patients who failed standard therapy all of the time. “Patients with this genetic abnormality might consider experimental treatment regimens instead of standard therapy,” he says. Results recently were presented at a meeting of the Association for Molecular Pathology. 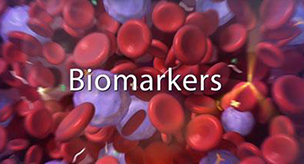 These biomarker tests now are available to Mayo Clinic patients and patients elsewhere through Mayo Medical Laboratories. But, the research still is in its infancy. Most patients with T-cell lymphoma don’t have these two biomarkers. The team is assembling a more extensive genetic biomarker panel designed to benefit a broader group of patients. “Everything — informatics, technology, collaboration — has to come together to get at each tumor’s personality,” says Dr. Feldman. “It’s a strength at Mayo that we can do this work.” Similar research is underway for lung and prostate cancers.